A boat's hull shape and the distribution of volume are key factors in determining how it will behave in varying wind and load conditions. The underwater characteristics of a vessel are responsible for allowing a multihull and its cargo to travel through the water. The faster and more effortlessly the twin hulls can displace the surrounding fluid, the less resistance and more efficient a catamaran will be. Typically modern catamaran designs have sharp bows to drive the vessel through the seas with as little wave making as possible. High freeboard assures a dry ride. Ample buoyancy helps keep the stems out of the water and spray to a minimum. Elliptical sections make up the first third of the hull, providing an easy entry in the water and some means to resist leeway. Towards the middle of the boat, gradually flattening out towards the stern, the sections become semicircular to help distribute buoyancy. These portions help carry payload and facilitate the hull lifting at speed. Basically, the majority of all cruising catamarans share these same underwater features. Decades ago very seakindly, double-ended hull shapes were the norm as found in the thousands of Wharram catamarans. They were easy to construct, relatively slippery, and provided ample freeboard. Unfortunately they could not carry a lot of cruising gear, had cramped accommodations and were not the best windward performers. Their sharp V-sectioned hulls and rudders were their only means of resisting leeway as they had no leeway preventing devices. Similarly, the narrow asymmetrical type hull, such as found in the Hobie 16 beach catamaran, is hardly used in today's cruising multihull. The idea was to keep the underwater appendage to a minimum and eliminate any keels or daggerboards. In contrast, the modern catamaran benefits from tank testing and computer-aided design. Composite molding technology allows for infinite shapes and each designer or manufacturer can now realize his idea of the perfect hull shape. Today's mini keels and daggerboards keep the cat hard on the wind and rival the weatherliness of monohull racers. Drag on the hulls is the main deterrent to speed and has many components. We have to distinguish between water and air drag. Water-induced resistance can be further broken down into drag caused by wetted surface and wave making. Wetted surface, which is the frictional resistance the hulls experience when they are passing through the water, is the main cause of resistance at low speed. Wave making becomes more important as boat speed exceeds hull speed, or 1.34 x square root of the waterline length. Wave making resistance is not as easy to analyze and is more complex than drag caused by wetted surface; it is primarily a function of weight and, secondarily, of hull shape. Pitch is another form of drag which can slow the boat down. This unwanted phenomenon is directly related to the buoyancy of the extremities and weight distribution. Wave-making resistance caused by the boat's constant plunging will slow a multihull, especially since it has less momentum to drive it through waves as compared to a single-hulled vessel. In addition the airflow over the sails will be disturbed by a constant change of attitude, further hindering efficient progress. Pitching can also be caused by placing items that are too heavy into the extreme ends of the multihull. In addition, various design- and construction-related issues can cause this problem, such as bridge decks extending too far forward of the mast and a high, heavy rig. Solid decking instead of trampoline nets, and/or large protrusions, which strangely some manufacturers claim break up waves, can also cause a hobby-horsing effect. Not only can this result in more wave-making drag than desired, but can seriously tire the crew. Any structure ahead of the mast can cause major slamming when having to face steep seas. Although many cruising catamarans, such as the Prouts, have been built with large bridgedeck structures extending forward to the bows, it is my opinion that an open trampoline, which poses no resistance to wind and seas, is imperative on a good cruising cat. 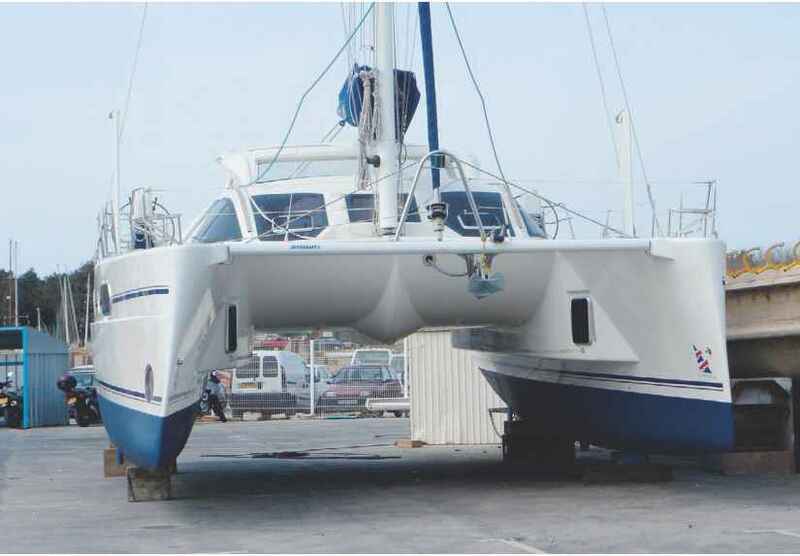 above High freeboard and angled-out hulls are trademark features of this capable Catana 521. Much thinking has gone into the hull shape of this catamaran, yet the pronounced step running along the inside of the vessel might create some wave slap in some conditions, a typical example of a compromise between space and performance. D. Racing multihull, with almost no wave making resistance below A popular French catamaran, as photographed out of the water at the Paris Boat Show. Note that there are barely several inches of clearance between the bridgedeck and waterline. The pronounced forward knuckle of the nacelle is claimed to break up waves. In my mind however, there is very little that can resist the continued impact of seas, and any conflict between the wingdeck and waves should be avoided. 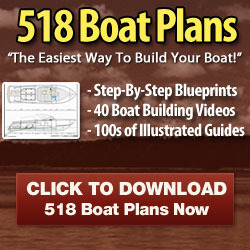 How to get catamaran hull resistance? How far should a catamaran bridge be of the water? How to construct catermaran hull show pictures?